Ally, from the Patterning-Only Group, completes a Squat to Stand Exercise. Several athletes demonstrated improved overhead squat mobility over the course of the 6-week cycle, however, no exercise protocol stood out as providing better results. Much attention and emphasis has been placed on proper movement and mobility in the past decade to include the development of an entire “mobility industry” as a subset of the fitness industry. Improved mobility has been identified by some as a measure of durability, and by others as a key component of athletic performance and strength development potential. This theory argues the major impediment to proper mobility is central nervous system related. 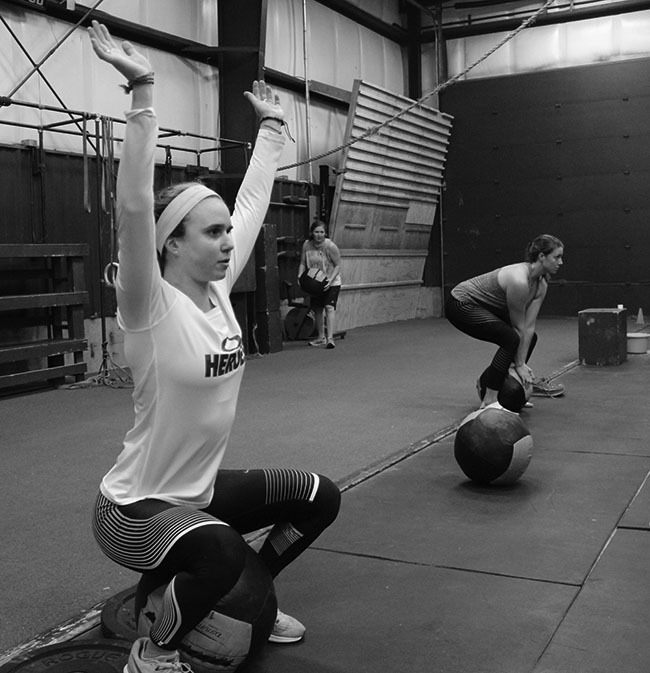 Athletes have forgotten how to properly fire and sequence muscles – primarily in the midsection and trunk, and this forgotten ability leads to mobility issues. The prescribed fix is to re-teach the athlete the proper muscle “patterning” via specific exercises which force the athlete to “turn on” midsection/core truck muscles and practice mobility patterns. In general, this theory argues that the sitting we in the western world do at work, school, in the car, at meals, etc. is the primary cause of this forgotten patterning. Proponents of this theory often point to toddlers and older people in third world countries who in general have good mobility patterns as evidence that sitting has inhibited our movement. This theory argues the major impediment to proper mobility is flexibility related. Tight lower backs, hips, hamstrings, shoulders, upper backs, etc. are the main inhibitor of proper movement and mobility. The prescribed fix is stretching. At MTI we’ve deployed both types of exercises, but until this mini-study, have never completed a focused study comparing their effectiveness based on a mobility assessment. 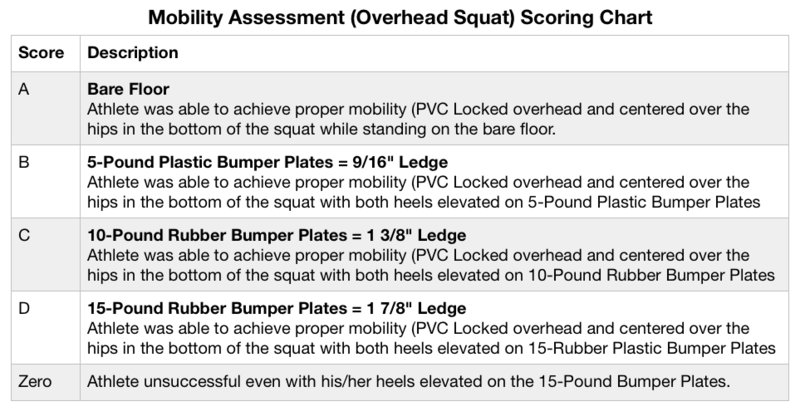 We chose the Functional Movement Screen Overhead Squat for our mobility assessment but developed our own scoring scale. The FMS Overhead Squat was chosen as our mobility assessment because it assesses ankle, knee, hip and shoulder mobility at once. Athletes were directed to place a piece of PVC on top of their heads, and their hands were adjusted to achieve a 90-degree angle at the elbow. Athletes performed the assessment in their stocking feet. Feet were adjusted to be slightly wider than shoulder width, with toes pointed straight ahead. Athletes were then instructed to push the PVC up overhead to elbow lockout, and then slightly back behind the head. Then, drop into a squat position with the thighs at or slightly below parallel. Proper mobility was achieved if at the bottom of the squat the overhead PVC was centered over the hips. Athletes first tried with their feet flat on a bare floor. If unsuccessful, they tried with their heels elevated on 5-Pound Plastic Bumper Plates. If unsuccessful, they next tried with heels elevated on 10-pound Rubber Bumper Plates. If unsuccessful, they next tried with heels elevated on 15-pound Rubber Bumper Plates. If unsuccessful here, the athlete received a score of “zero”. The scoring chart below. Click the video clip for an example of our mobility assessment. Pre, Mid, and Post Cycle, athletes were assessed for mobility using the assessment described above. 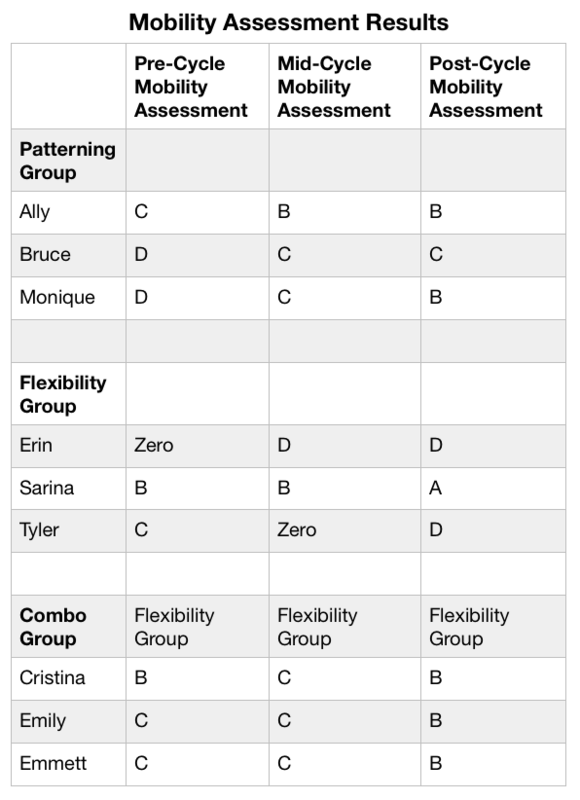 There were three outliers: Tyler in the Flexibility Group actually got worse and dropped from a C to a D grade.Six of the athletes in the study improved their mobility by one grade, based on our assessment, over the course of the 6-week cycle. Monique, in the Patterning Group, improved two grades, from D to B. And Cristina, from the Combo Group, stayed at the same grade. Eliminate these outliers, and two athletes in each group improved their mobility by one grade over the course of the 6 week cycle. The goal of the study was to identify which exercise prescription, patterning only, flexibility only, or a combo of patterning and flexibility exercises, performed best to improve mobility. The results were inconclusive. → Re-complete the study but chose different patterning and flexibility exercises. With the exception of one exercise, all of the exercises chosen for this study came from MTI’s existing exercise menu. It could be there are simply better patterning and mobility exercises to try. → Move from studying the best way to improve mobility, to studying the link between mobility and durability, specifically, comparing mobility to fitness in terms of the most effect on durability.